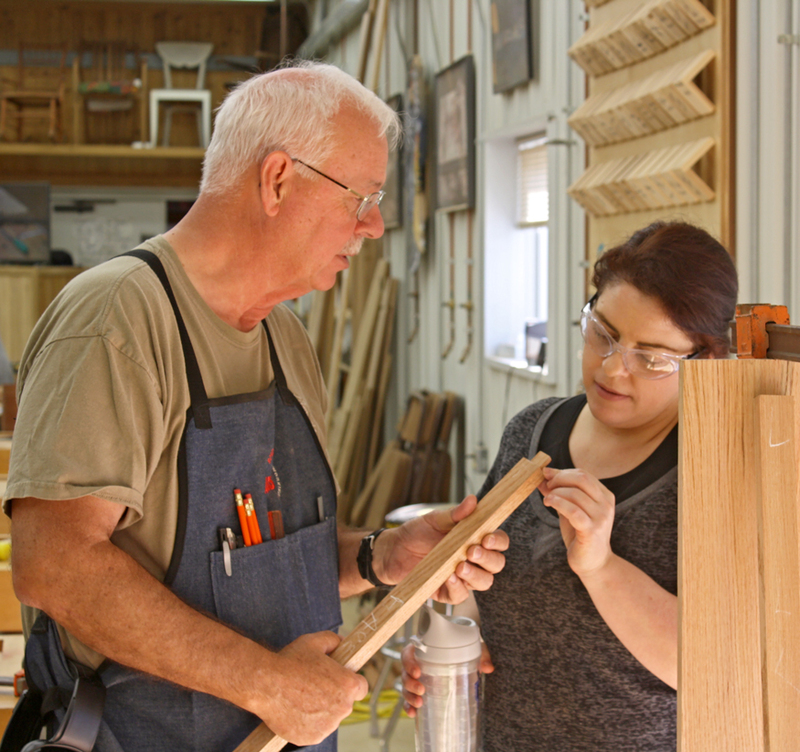 I spent last week in the company of a dozen or so woodworkers at the Marc Adams School of Woodworking in Franklin, Indiana. We were working on reproductions of the iconic Gustav Stickley/Harvey Ellis No. 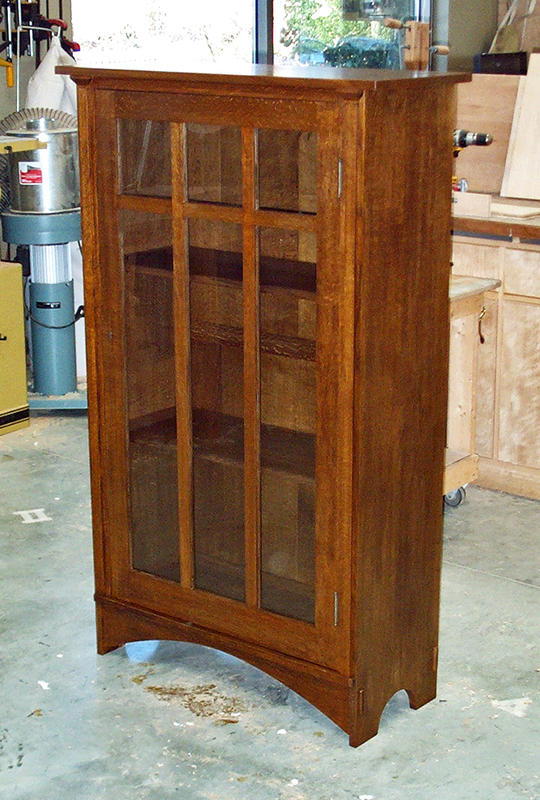 700 glass door bookcase. This is one of my favorite pieces from the American Arts & Crafts movement of the early 20th century. One could argue (and I have) that this is one of the best proportioned pieces of furniture ever designed. The first one of these that I saw in person impressed me by being much smaller than I thought it would be. I was expecting something monumental, but it isn’t that big; not quite five feet high and the top is three feet wide. I enjoy teaching, but I only do it a few times a year and have only repeated one project as a class. I should probably be more show-biz about it, develop a schtick and make the rounds but that isn’t who I am. It’s a lot more fun to pick an ambitious project and see how far we get. I think it’s a better experience for the students as well. Taking on a challenge means accepting risks, adaptive problem-solving and trying things you’ve never done before for both the teacher and the class. I was blessed with a great group of students and wonderful assistants. If you’ve never been to Marc Adams, put it on your bucket list. 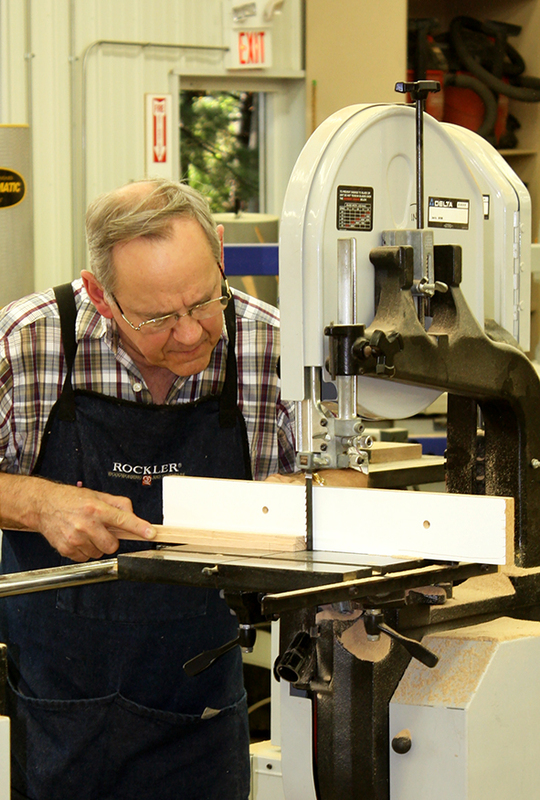 There is no other woodworking school like it and Marc and his staff set an example for us all. It’s a friendly place, full of first-class equipment and run by people who know their stuff. As an instructor it’s a real plus to be able to say to Zane (or any of the staff) “I’m going to need a hollow-chisel mortiser set up with a 5/16″ bit in about an hour” and hear “how many do you need?” in response. It’s also nice to be able to talk about how I might do something and how to safely set up for the same task for several workers with a wide range of experience, confidence and skill levels. I am always impressed with the solutions and I always learn a thing or two from the staff and the students. I build along with the students and at times it was tough to stay ahead of the group. I was happy to see a few guys who had taken my classes before as well as get to know some friends I hadn’t met yet. A camaraderie quickly develops among the students and a big part of the learning experience is helping out or asking for help from the person at the next bench. That’s the kind of thing you see in real-world workshops; a genuine desire to help and pass along some hard-earned knowledge, or a simpler solution that might not be obvious. As the days went on, dry assembled cases replaced stacks of rough lumber at each of the benches. Folks who had never cut a mortise before made very nice through mortise and tenons joints to attach the lower rails to the case sides. With that experience behind them, offset shouldered tenons on the door and a dovetailed case rail began to be viewed as the “easy” parts. I meant to give a thorough presentation of the dovetail joint, but by the time I was ready the two guys I gave a brief explanation to, had shown the others how to do it and the class was ahead of me. I think most of woodworking is problem-solving and sifting through the numerous options available for the task at hand and the way an individual operates. My goal is to show the way I choose to do it, and work through the pluses and minuses of my choice and other options. A well-equipped woodworker isn’t the one with the most tools, it’s the one with the ability to use what’s available to arrive at an acceptable outcome. The creation of a nice piece of furniture isn’t just about the furniture. It’s an opportunity to learn about your self, and about other people. That’s the most important thing. One student had to leave a couple of days early because hurricane Matthew was headed straight for his house. Before he left he got some help preparing parts and when he dries out I’ll be helping him via e-mail to get caught up. We also had a father and daughter working together, and that was a cool thing to see, especially when we discussed who was the supervisor. We could have set up an assembly line to ensure that the students went home with completed projects. They would have spent the week standing in line waiting for their turn at the next machine. Instead they went home with nearly completed cases, a look at what one-off furniture making is like, and the confidence to take their time and add the finishing touches at home. I count that as wildly successful. It hasn’t been “officially” announced yet, but I’ll be back at MASW next year for a week-long project class, a weekend project class, and a weekend of teaching SketchUp. 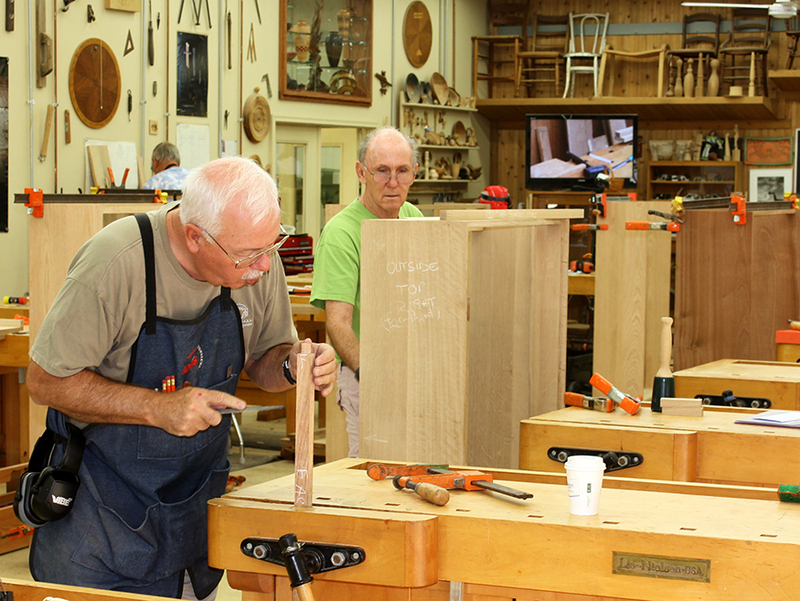 VISIT THE MARC ADAMS SCHOOL OF WOODWORKING WEBSITE AND SIGN UP TO RECEIVE NEXT YEAR’S SCHEDULE. Want to build your own reproduction of the Gustav Stickley No. 700 Bookcase? MASW is the real deal, and yes, nothing else like it. I love teaching there. Thanks for all your hard work! I hope to take one of your classes someday. One of the guys in class was thinking of art glass in the door of his . . .
Hi Bob, Hope you are well and happy! I’ve always loved this #700 Stickley Bookcase. The photo of the finished project and your article are very good. I’ve always appreciate your articles and books, even though I am not a woodworker. You are very talented in both writing and woodworking. Today I came across this page while working online and enjoyed stopping to read and see what you are up to. Maybe we can catch you at a woodworking show sometime this winter. Take Care. Always good to hear from you and Dale. Hope all is well with you and yours.